Olympic, a Seattle hotel. Book at American Sky. Pure luxury can be found at Fairmont Olympic; a premier hotel nestled in downtown Seattle, offering timeless elegance and style amidst the lively city. Fairmont Olympics’ beautiful rooms and suites are sleek and comfortable, featuring luxurious amenities and unbeatable views of the city. The service here is supreme; with friendly and supportive staff offering a helping hand to ensure you have everything you need and more. Fancy venturing out of the hotel? Its prime location means you’re in close proximity to some of Seattle’s best attractions, including the towering Space Needle and vibrant Pike Place Market. After a day of exploring, take your pick of two classy restaurants, including one of the city’s oldest oyster bars, Shuckers, before enjoying a pampering treatment at Penelope & the Beauty Bar. This sleek hotel is located in downtown Seattle, only a 15 minute walk to Pike Place Market and Elliot Bay waterfront, and a 10 minute drive to Space Needle and other fantastic attractions. The ambience inside the hotel is intimate and calm, but you’ll only be a short distance away from the hustle and bustle of Seattle. 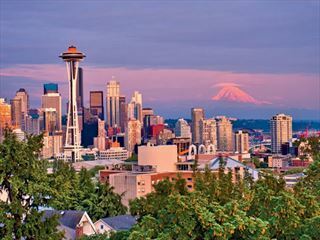 The hotel is a 20 minute drive from Seattle-Tacoma International Airport. Fairmont Room – Intimate rooms with elegant mid-century décor, a spacious en-suite bathroom with rainfall shower, a cosy dressing area, a work desk, and a lovely courtyard or city view. 33-39sqm. Deluxe Room – Larger rooms with the same amenities as before, plus a sitting area and gorgeous pool or city views. 40sqm. Executive Suite – Luxurious suites with a chic bedroom with an en-suite marble bathroom, and barn-style doors that lead on to the separate living room, fit with a sleeper sofa, modern wing chair and work desk. 42sqm. Deluxe Executive Suite – Very spacious, with the same amenities as before, plus an extra wing chair. 46sqm with city views. Corner Suite – Lavish suites featuring a separate bedroom, two marble bathrooms and a living room fit with two big wing chairs, a sleeper sofa, a dining table for four, and a Murphy bed. 116sqm with city views. Cascade Suite – The hotel’s signature suite, these luxury suites feature two bedrooms with large picture windows – with the master bedroom featuring an en-suite bathroom with jetted tub, a fire place, traditional American antiques, a guest bathroom, and dining room for 12. 279-321sqm. Olympic Suite – A premium suite featuring one bedroom and the availability to add a second bedroom, plus a fireplace, large picture windows with city views, a grand piano, and a dining area for 12. 279-321sqm. Shuckers – This stylish restaurant is one of Seattle’s oldest oyster bars, offering 13 different kinds of oysters prepared in nine different ways, as well as seafood and fresh fish. The Georgian – This gorgeous restaurant offers French-inspired Northwest cuisine, as well as a stunning regional wine list in the premier dining room. Live jazz music is played every Friday and Saturday evening. Reservations recommended. Penelope & The Beauty Bar – One of Seattle’s premier day spa and wellness centres, this fantastic centre offers a myriad of pampering treatments, including massages, nail treatments, facials, and make-up and hair services at the personal style bar.